Choose the most realistic martial art training available and sidestep the hopeless nonsense. Read on to discover which training will give you the best chance of surviving a violent attack. With a little bit of advice and some common sense, you'll easily be able to make smart decisions about this area of your personal defense plan. Avoid wasting years of your life practicing something that won't help you in a REAL fight for your life! Do You Need Martial Art Training? There are some very good reasons to start regular martial art training, but you need to give some thought to a few things before you jump right in. Firstly, I believe that you absolutely should pick a good martial art and practice it regularly with a group of like-minded people. All of these benefits are reason enough to join a martial art training class on their own. However, if you choose the wrong martial art, you may fail to learn ANY of them! It might sound crazy but doing unrealistic martial art training can actually make you LESS capable of surviving a criminal attack! How can you become LESS capable? What Is A "Realistic" Martial Art? Realism is SO important when choosing a fighting style. There is martial art training out there that is completely out of touch with the realities of criminal violence. For instance, many "traditional" martial arts such as Kung Fu or Karate are often taught in a way that makes no sense in today’s world. The problem is not with the arts themselves though! This is the tricky thing. Many people may get very offended when it is said that Karate (for example) is not a realistic art. "But my sensei says Karate is totally effective and realistic!" This may, in fact, be true for them, and it used to be true of the way karate was taught by the original Okinawan masters. The way they taught Karate was highly physical and extremely tough. They used hard contact and real speed when they practiced fighting. This realism and effectiveness even stayed with the art when it was first taught to American students in the 50's and 60's. Sadly, this realism was gradually lost when karate started being taught to the general public and even to children. Big "Karate clubs" with hundreds of students were opened in America and these new, "soft" students couldn't handle the hard contact and the rough physical nature of the art. Karate sensei's (teachers) were losing students in their droves. Many of these senseis had started these Karate clubs as businesses and started losing money. So What Could They Do To Keep Students? Well, they had to give the customers what they really wanted. 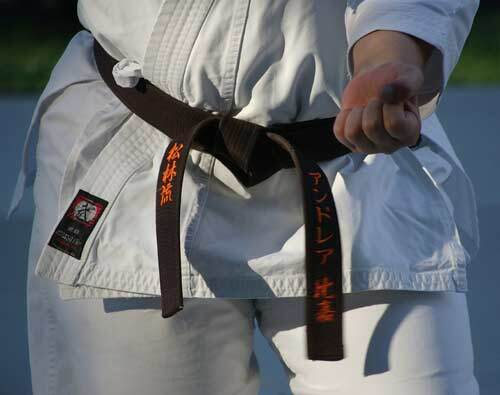 Most regular people who come to a Karate "dojo" (club) only want to improve their fitness and perhaps learn a few "moves" that they can show off to their friends and family. Many of them are not really planning to ever use their martial art training to save their lives from a violent criminal offender. So many Karate teachers "watered down" their art to make it more suitable for their customers. As a result, today’s Karate and most other so called "traditional martial arts" such as Kung Fu, Tai Chi and Taekwondo are no longer as effective or realistic as they used to be. Where Can I Find Realistic Martial Art Training? The surprising thing is that the most realistic and effective martial art training has been right under everyone’s noses for ages. These arts may not seem as exciting or "mystical" as the oriental martial arts that you have seen in the movies, but they have many important things going for them. These fighting arts are known for "toughening" people up and improving their fighting skills in a very short amount of time. A person who spends a few months becoming fit and skilled at boxing (for instance) will often be surprised at how much more capable they are at defending themselves. The real self confidence (not "false confidence") that you will gain from spending some time learning to box or wrestle is something that becomes a part of your body language. Criminals often notice a person who has real confidence in their ability to fight back and will usually decide to stay away. Notice that I said "real" confidence? The false confidence or arrogance that some people get from learning arts like karate is nothing but an illusion. These people BELIEVE that they can fight effectively but most have never truly "tested" their abilities. What goes on inside the safety of a Karate Dojo often looks very different from the kind of violence that occurs on the street. Fortunately for these men and women, they will probably never be "tested" by a truly violent person in their lifetimes (statistics are on their side). If they ever are, their illusion may come crashing down around them in a display of violence they were never really prepared for. Boxers, wrestlers and judoka (judo players) are often very tough individuals. They have typically gained real skill at fighting against other people who are actively trying to resist their techniques. This competitiveness forces them to get better at all the moves they practice. And since the people they practice against aren't going to just "let them win", their skills are honed to a high level. The kind of confidence they gain through this type of martial art training actually IS real. It's not imagined. This is the kind of confidence that let criminals know not to "mess" with that person! If a criminal makes a mistake or simply doesn't care about that person's obvious skill, then all is not lost. If they really are attacked, the boxer or judoka can still use their hard won skills to fight back effectively. If they do this with enough speed and violence, they have a good chance of "winning" or defeating their attacker (of course their odds go down if the criminal uses a weapon). At the very least, the criminal may decide to break off the attack and find a weaker, less capable person to rob. As I mentioned in my Criminal Mind page, criminals don't want to risk getting hurt or even killed by their "victims" if they can help it. It doesn't make sense when there are so many other weak, unskilled, unaware people out there that they can attack instead! The most likely way this would happen is that the criminal would notice the bodily signals or "vibe" that the boxer or wrestler was giving off and simply avoid him or her altogether. The "almost victim" may not even notice this happening if they are not very aware of their surroundings. Even without awareness this effect can protect them from being attacked. This is the ideal outcome. Being "deselected" by a criminal without even having to DO anything! There are other fighting arts that have been created by people who understand that much of the traditional martial art training out there has become "watered down". I have spent some time learning the following arts and I have found them to be really worthwhile. Of course, much will depend on the instructor that you find and his or her experience and professionalism. But the systems themselves are sound and worth a serious look. 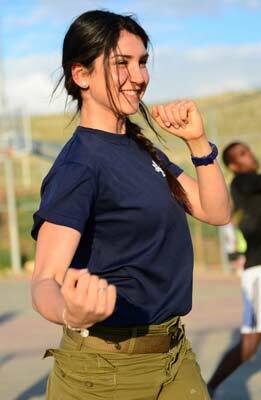 This fighting art was first created for the Israeli Defence Force. The Israeli intelligence organization "Mossad" also uses a variation of Krav Maga. It was designed to be a simple but very effective fighting system that includes all aspects of modern violence. It teaches "unarmed fighting" (fighting without a weapon) and the skills to disarm an attacker who is using a knife or a gun. There is a big emphasis on fitness in this art (I know firsthand how tough this aspect of the art can be!). You will enjoy some vigorous "warm ups" that get you huffing and puffing. But it will really help you to increase your strength and stamina. Well worth it! I highly recommended this system, especially for those with no prior martial art training. The idea behind it is to train someone to become capable of protecting themselves in a very short amount of time (not the years and years that traditional martial arts often take). I cover what I believe are the top 5 Krav Maga Moves on their own dedicated page, so be sure to take a look! Watch this interesting Krav Maga video for an example of the kinds of techniques you will learn when training in this art. At the start of World War 2, the American military chose William E. Fairburn and Eric A. Sykes to create a simple but brutally effective system of fighting that could be quickly taught to thousands of new soldiers who were going into battle. The system HAD to work even if the soldier using it was a smaller man or was carrying large amounts of equipment. It needed to be simple to learn yet deadly. After all, these soldiers were going into mortal combat against enemy soldiers who would be trying to kill them by any means possible. The result was a fighting system that lived up to and exceeded all those requirements and expectations. "Combatives" is a fighting skill that can be learned by anyone and can give the person learning it all the same benefits that it gave those tough soldiers so many years ago. Although Fairburn and Sykes have since passed away, there are several students of theirs who still teach it in an accurate way. 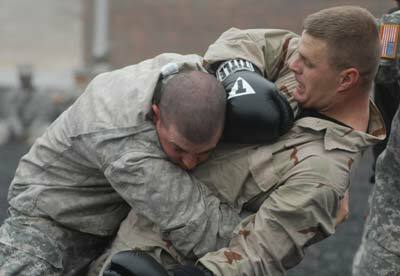 I have spent several years learning and practicing Combatives. The mental aspect of this system is also crucially important. It teaches a very aggressive and "attack" oriented mindset. There are wonderful resources online that you can use to get yourself up to speed with Combatives even if you are not able to find an instructor in your area. Check out my page on Unarmed Combat Training to find out more about this exciting method of fighting. I would recommend trying World War 2 Combatives if you want to rapidly learn the skills required to survive and win against a violent criminal attacker. Amok! 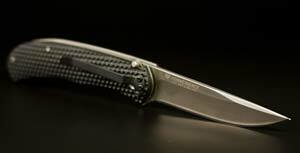 is a system of using a knife to fight off an attacker or several attackers that was founded by Tom Sotis. I found Amok! to be an exciting system with a lot of fast movement and deadly techniques. It is meant to teach you to fight off a criminal attacker who is trying to kill you. My instructor was a young guy in his early thirties who was highly skilled in the art. His knowledge of not only Amok! but also teaching was excellent. Amok! instructors are trained to teach you these life saving skills in a very interesting way. Using special training knives (blunt wooden knives covered in hard foam) they engage you in "fights" right from your very first lesson. Of course, they don't overwhelm the student too early on, but they do challenge you! The idea is to "learn by doing". So they don't spend much time talking about the techniques, they would much rather show you with the training knives. I found it amazing how quickly I "got it" by actually using the dummy knife. Before long I was moving quickly and dodging knife strikes and giving my own strikes back with some force! Be sure to check out my page on Knifefighting to find out more about the Amok! fighting system. Having given you an idea of the martial art training that is out there, it's now up to you to DO something with this knowledge. The best advice I can give about this topic is to choose a good, realistic martial art out of the ones I have recommended and sign up for a class in your area. You will often find an interesting group of people who are just as concerned about their personal safety as you are. Great friendships can be made at these classes too. As long as you are consistent and give the classes your best effort, you will be surprised at how quickly you gain some real skill. Pre Emptive Strike - Hitting first in a violent fight is a good tactic. Self Defense For Women - Women face different challenges out there.